"You are a kite dancing in a hurricane, Mr. Bond." The trilogy of Casino Royale, Quantum of Solace, and Skyfall formed a thematic arc for James Bond as a character. Casino Royale finally built him up with both his strengths and his weaknesses; Quantum of Solace broke him down after taking away the one thing he loved; and Skyfall built him up again by directly confronting him with his real weakness (not his fear of loss, but his age). 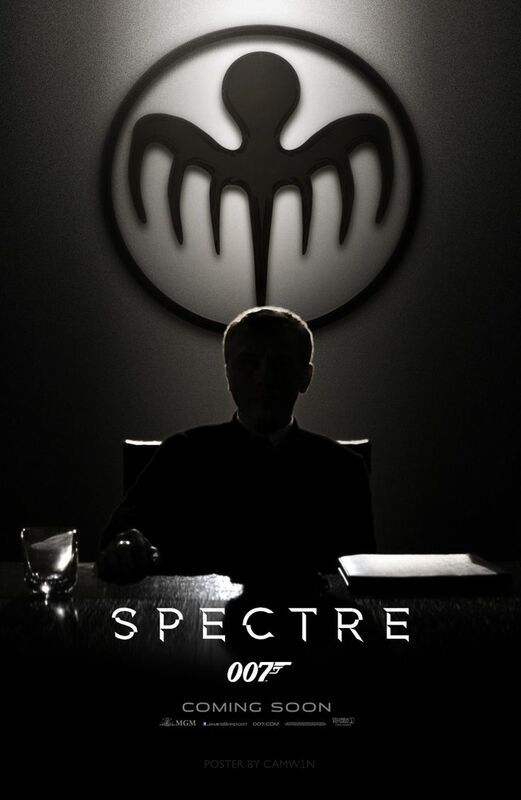 Spectre essentially abandons this development in favor of going all-in on the Bond mythology: not only does it resurrect the famous shadow organization of the film's title, it desperately crams every Bond trope into its padded run time, from women, cars and martinis, to a secret hideout and a fight on a train. It has a new M, a new Moneypenny, a fairly new Q, new MI6 digs, and it name drops the existence of a 009 (one of Alice's favorite moments involves a gag where 007's car plays 009's music). It loves the Bond-ness of it all, and spends plenty of time soaking in it—which can be fun even if it sometimes feels like a kid playing with his new toys. The most effective element of this mythological impulse is the resulting narrative interconnectivity of the four Daniel Craig Bond movies. Spectre takes the dots drawn by these previous films and attempts to elegantly connect them all. 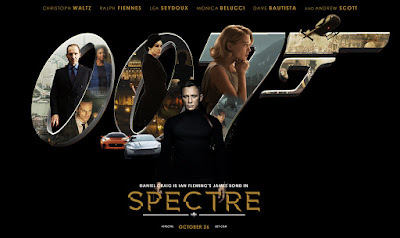 It collects Le Chiffre, Mr. White, Greene, Silva, Vesper, and the previous M (Judi Dench), along with the bread crumbs scattered around Skyfall ranch in the previous film, and it does its darnedest to sweep them all together into a neat pile. While my language obviously gives away how well I feel this effort is pulled off, it does create a feeling of unity among the four movies which is pretty much unprecedented in the Bond franchise (even if it's basically commonplace in, for instance, the Marvel universe). The Bond movies have always been more stand-alone films than sequels, and Spectre attempts to establish a continuity (at least for Daniel Craig). What this means for the future of the Bond series aside (how will they fit a new actor into this timeline when Craig leaves? ), what this means for Spectre as a film on its own terms is that it has to do a lot of heavy lifting that only really pays off retroactively for the movies that came before it. These movies have always been burdened with a level of narrative exposition that I haven't been able to completely embrace even after marathoning the entire series, and here that crutch is exponentially magnified. But even more problematic than the amount of time spent tying up these loose ends is the film's desire to give Bond and his nemesis a backstory. I won't ruin the specifics, but suffice it to say that they're crammed into a mold that is neither very unique nor very natural. The reason the character development of the previous three Craig films worked so well was because of the way we could feel it sweating from his pores, we could see it in the wrinkles of his leathered face. It was an inextricable part of his performance that tied into the plot seamlessly, and instead Spectre gives us what is essentially a final act twist that feels slightly artificial, as if we can see too much of the magician pulling the tablecloth out from under us. If I sound overly negative on the film it's simply because it took the greatest thing the Craig films had going for them and squandered it for a load of unnecessary prequel-esque backstory. And it's not like the movie doesn't know how to pull off this naturalism that the previous Craig films accomplished. Exactly one scene before the big reveal, there's a moment which feels so inextricable to Bond's character that I actually bought in fully to the growing relationship between Bond and one of his female co-stars. He's always been a chivalrous misogynist, willing to take advantage of women but only on his own terms, and we get to see this play out in a way that simultaneously reveals the core of this conflicted part of him while demonstrating the extent of his enemy's malice and the depth of his lover's desperation. This moment is also built on the film's central thematic concern: the pervasive/invasive nature of government surveillance. Ever since Pierce Brosnan took up the reins as 007, the franchise has been concerned with the way new technology affects our lives, from the fear of satellites in the 90's to the Internet-savvy super-genius Raoul Silva in Skyfall. Now, in the post-Snowden era, these anxieties are transformed into a fear of drones and data gathering services (there's even a direct reference to the Five Eyes global intelligence network Snowden leaked information about). The most important element of this development is the way it implicates the supposed good guys in the evil doing. This isn't somebody else, some political other causing chaos from the outside, but rather someone inside the very system built to stop the same bad men it now employs. Our efforts at counterterrorism become the violence they seek to eliminate. There's plenty of other things going right for Spectre even if it's retconning of central characters ultimately feels forced. As anyone who's film fan enough to spend time on this site will have guessed, Hoyte van Hoytema's cinematography is stunningly gorgeous. His world of darkness and shadows fits right in with Roger Deakins's work on Skyfall. His greatest strength seems to be sculpting faces with light, which plays well with the distinctive features of Daniel Craig's face and gives Lea Seydoux's golden curls the classical elegance of not only the best of the Bond girls, but the best of Hitchcock's blondes as well. Equally unsurprising is that he excels with this sort of quiet ambience a bit more than with the action, but together with editor Lee Smith (a frequent collaborator with Christopher Nolan) the action scenes are always exciting. The more striking shots are actually the well timed explosions, one of which in particular is framed against Craig and Seydoux in a way that is both impressively realistic (no cgi or green screen strings) and expressively artistic (both in color and in emotion). Speaking of the characters, there's an impressive cast wrangled together here even beyond the big names I'd seen advertised. Monica Belluci has a perhaps disappointingly small part relative to the amount of fuss that's been made about Bond finally being with someone his own age, although I'm not sure rounding off the edges of his character is really the right way to go anyway. As much as I want him to, Craig doesn't do quite enough here to put him over Sean Connery as my favorite Bond, although I still think he has the greatest Real Acting Chops of any of the previous players. I love Cristoph Waltz and Andrew Scott's almost caricatured villains even if I have a hard time taking them seriously as Real-Life Bad Guys, but I actually got even more pleasure out of the almost completely silent Dave Bautista. I would say Lea Seydoux is the best she's been since Inglourious Basterds, but I can't do that now that I've seen The Lobster, and "the best she's been since The Lobster" sounds disingenuous. I had high expectations for Ralph Fiennes, and he managed to meet all of them both in terms of the class and sophistication any M should have, and the history of violence his specific incarnation claimed in Skyfall. 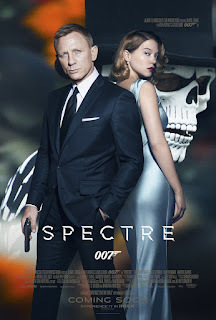 Because of the large scope of Spectre and because I just spent several months rewatching all the previous Bond movies, it feels like there's an impossible amount of material to cover here, but I think the important points are these: it's successful as an action movie with espionage elements and it's an interesting but troubled attempt to do something fairly radical with the franchise and it's mythology. In terms of pure entertainment it's a little long but generally well paced, and it should be a fun time for anyone with reasonable expectations. For me, it's pure middle-ground Bond: it's not bad enough to be included in the vulgar auteurist selections like You Only Live Twice (or eccentric enough to match with the excessively dour of Quantum of Solace), and it's neither campy nor serious enough to fit alongside Goldfinger or Casino Royale. It has its strengths and weaknesses, and while it won't be making it into my favorites (I think I even prefer Thunderball, but I'm unreasonably in love with how boring that movie is), it's enjoyable enough in its own ways. PS. This is the fourth Bond without an iris wipe in the gun-barrel sequence (after Dr. No, For Your Eyes Only, and Casino Royale).